Richmond, BC --July 27, 2007-- zCover today announced that its versatile, resilient and user friendly new iSAglove cases for Apple's iPhone are now shipping. zCover's iSAglove design is available in four functional combos and focuses on intuitive usability while offering protection in its fullest form. 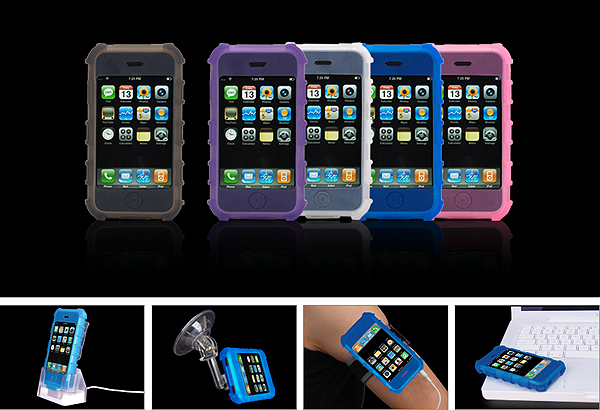 The iSAglove will first be released in five zCover ice series colors: blue, purple, grey, pink, & clear, each one designed to work seamlessly with iPhone's light sensor. The iSAglove design is a perfect fit for every feature of the iPhone; that's because it was designed from a real active Apple iPhone. "As we anticipated, the iPhone's sophisticated and compact design required precise molding and tooling to create the ideal contoured case for iPhone." said Sean Sa, vice president of zCover Inc. "zCover held fire and waited patiently, finalized our design until we got a real active Apple iPhone. It looks like zCover's patience paid-off." zCover's iSAglove design focuses on intuitive usability while offering protection in its fullest form. zCover has always focused on the merging of function and style, but this time the iSAglove not only provides full access to all of the iPhone's functions, but also has a few enhanced functions of its own. What may very well become their signature style, zCover incorporated a unique slide-edge cut into the iSAglove at the top edge of the screen. This ensures the iPhone is protected without blocking the iPhone's proximity (built in motion) sensor. This feature alone differentiates zCover from the others. Reinforced corners support a natural hand position when in horizontal mode and have a reinforced silicone layer that works as a "crash cushion" during drops and falls. The rugged side finger grooves provide a comfortable fit for any sized hand, and the universal headset jack opening has been tested to fit your favorite pair of Apple headphones. zCover's innovative port flip-cover has been applied to the iPhone perfectly, protecting the Apple dock port from sand, dust, dirt and liquids, while still allowing full accessibility for charging, or even docking, your iPhone while still in the iSAglove case. The unique belt clip system allows you to turn your iPhone horizontally and vertically with ease. Specifically molded and uniquely designed for all the functions of the iPhone the iSAglove will first be released in five zCover ice series colors: blue, purple, grey, pink, & crystal clear, each one designed to work with the iPhone light sensor. zCover's iSAglove is available in four functional combination packages. Offering you full protection for your iPhone, and the function of mobility with our innovative 360 degree rotating belt clip, this system is the perfect "All-you-need-for-iPhone" combo for any iPhone owner. This package offers maximum mobility for the active iPhone owner. You get the iSAglove cover protection, the 360 degree rotating Belt Clip, and the perfect-fit rotary armband, perfect for outdoor enthusiasts hiking and biking through the woods, or the fitness fanatic jogging through the streets. The Car Kit adds a whole new element to the experience of owning an iPhone. Besides the protection of the iSAglove cover, the mobility of the 360 degree rotating Belt Clip, the additional window clip allows you to attach your iPhone GPS style in your car, as an entertainment centre on the side window, or as a vertical stand at your desk. It doesn't matter which way you turn it, the iSAglove Car kit is ideal for those on the road.